Do you have a hard time trying to figure out what to get your girlfriend or nanny? A recent survey conducted by Western Union found that 83% of respondents would rather receive cash than a gift worth the same amount! This makes sense to us since oftentimes you end up spending more on gifts and items are either lost (kids toys!) or lose value over time. 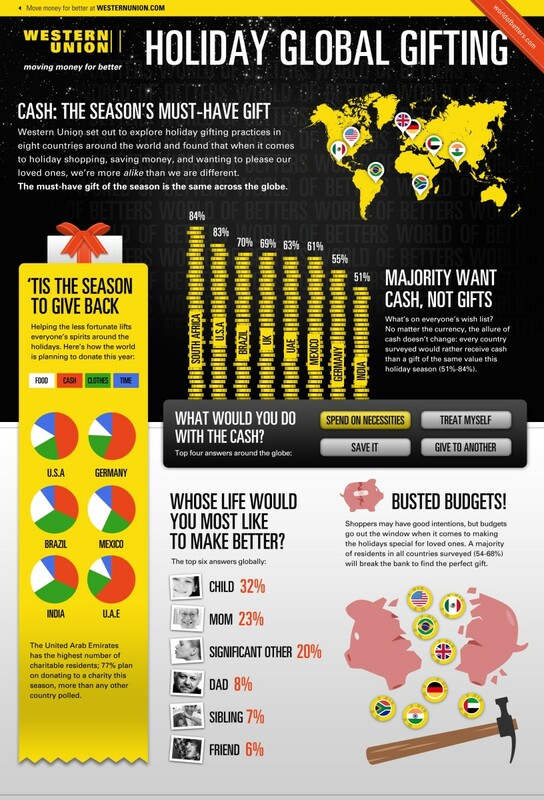 According to 2011 Western Union Global Gifting Survey, giving cash is a solution to holiday over-spending (the number one worry for Americans this holiday season) and the pressure to find the perfect gift. And, while 69% of consumers surveyed said they plan on making a holiday spending budget this year, 63% said that, despite making a budget in 2010, they overspent. So, even those stuff is nice, it is clear that cash is king and certainly has a greater value than any cutesy present out there.